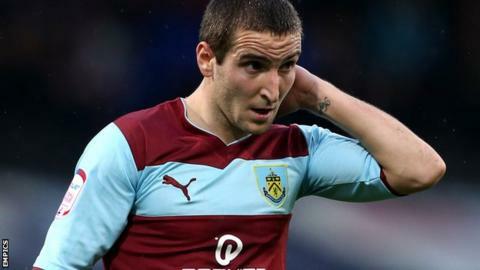 Martin Paterson is keen to make a bigger goalscoring contribution for Burnley after netting the equaliser in Saturday's 2-2 draw at Peterborough. "It's up to me to score more," Paterson told BBC Radio Lancashire after ending his three-month goal drought. "I'm disappointed with my tally but I'm working very hard to rectify that." Paterson's last goal came in Sean Dyche's first game in charge - a 2-0 home win against Wolves on 3 November. Dyche added: "'Pato' deserved a goal. He came on and affected the game. Barring a brilliant save from their keeper, he gets a brace and we go away with the three points." Burnley have a wealth of striking options to choose from, with Charlie Austin, Sam Vokes and Danny Ings also pressing for starting positions up front. on Saturday and opened the scoring after 64 seconds with his 24th goal of the campaign. And Paterson recognises that Austin's form makes him very hard to dislodge from the team. The former Stoke and Scunthorpe forward added: "With the amount of games I've missed over the past three years [because of injury] every time I go out on the pitch, regardless of where I play, is a blessing for me. "Deep down, I want to play down the middle and I want to score goals. "It's hard when you play one up front and Charlie's scoring with pretty much every touch he has. It's pretty hard to get a game - I'll possibly have to shoot Charlie to get a game if I'm honest," he joked. "We're very different, but good, strikers. It's healthy, if we want to push on, to have that competition."